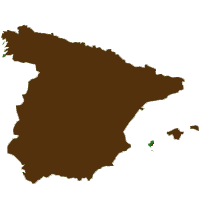 Self-guided long distance walk on the Northern Camino. Customize your walk with the distance of your choice. 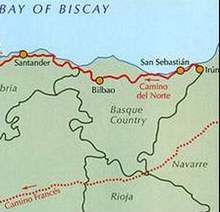 The Camino del Norte or Northern Way is the wildest route, along coastal paths, to reach Santiago de Compostela , crossing Basque Country, Asturias and Galicia. The natural landscape is breathtaking and the cultural wealth is abundant. The whole route consists in 37 walking stages which can be split into shorter sections. This 8 day section crosses the Basque Country, starts in Irun just from the French border and arrives in Bilbao. Around 160 km along the coast and in the countryside. This is the most beautiful area of the Camino del Norte. The route follows the Jaizquibel mountain which is the oceanic start of the Pyrenean range. Take the boat across the Ria Pasajes and continue to the elegant city of San Sebastian. This stage is crossing busy fishing ports and high cliffs diving in the Ocean. From the old narrow streets of Orio to the sandy beach of Zarautz and finally reaching the colorful port of Getaria. The first part of the stage between vineyards and meadows, quickly changes into peaceful hamlets before arriving to Zumaia port and its impressive gothic church. A marvellous hilly bucolic stage combined with remarkable monuments like the fortified Church of Saint Tomas de Bolibar, the Cenarruza Ziortza Colegiala or la Ermita de Santiago With the final historical stage of Gernika, craddle of the basque identity and infamous for the Nazi Germany’s Luftwaffe airial bombing in 1937 immortalized by Picasso’s painting. After walking along the busy road getting out of Gernika you will reach a forest road up to the Gerekiz Pass. Night in Lezama. Leave Lezama and its industrial environment and enter the coniferous forest, walk up to the Monte Avril summit and follow the path along the ridge line before descending towards the Biscayan Capital of Bilbao. The Casco Viejo is worth the visit with the Cathedral Door dedicated to Santiago. The amazing Guggenheim Museum of Contemporary Art is also a place to discover. 2 and 3 star hotels . Private bathrooms. 2 and 3 star hotels or guest houses. Half Board. English assistance for your reservation . Ends in : Bilbao (international airport).